Be the first to share your favorite memory, photo or story of Frederick (Fritz). This memorial page is dedicated for family, friends and future generations to celebrate the life of their loved one. Preceded in death by his parents, Irving and Celia Cassman; sister Claire Krasnow. 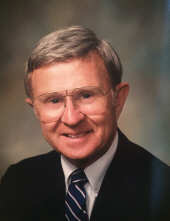 He is survived by his wife of 67 years Molline; children: Amy Friedman (Sandy), Joel Cassman, Bob Cassman (Kym); six grandchildren and one great-grandchild; relatives, friends and colleagues at the Law Firm of Abrahams Kaslow & Cassman where he practiced since 1949. A special thanks to the staff at Rose Blumkin Jewish Home. "Email Address" would like to share the life celebration of Frederick (Fritz) S. Cassman. Click on the "link" to go to share a favorite memory or leave a condolence message for the family.